The Siemens ultrasonic instrumentation family has a long and successful history. We’ve always been a hard- working group, and we aim to please. Reliable? You can count on it. Intelligent and durable? We have both brains and brawn. As a group, we've set the industry standard for accuracy and performance with our innovative approach to level measurement. Even now, with solutions for more than a million applications, we're still grow- ing! Introducing the newest member of our team: SITRANS LU150/LU180. SITRANS LU150/LU180 is a short-range, non- contacting ultrasonic level measurement transmitter. 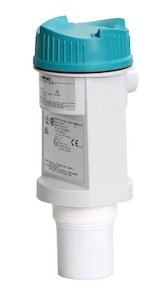 IP68 rated, SITRANS LU150/LU180 has a rug- ged, fully encapsulated PVDF sensor that is resistant to corrosion, chemicals, and ex- treme shock. With only two wires, installation of the unit is straightforward, and its two-button inter- face makes it both simple to configure and easy to use. There are many mounting possibilities for SITRANS LU150/LU180, as there are four pro- cess connections to choose from, including the 4" Tri-clamp that allows the unit to be re- moved easily if necessary. The reliability of the level readings are based on Sonic Intelligence echo processing algorithms that Siemens has been refining for decades. These algorithms differentiate the true material level echoes from the false ones that can result from acoustic or electrical noises, as well as from agitator blades in motion. It's effective, accurate, unique, and it's exclusively Siemens. For enhanced functionality, such as remote displays, mounting options, and monitoring solutions, Siemens offers supplementary components and accessories to complete your level measurement package. For more information, download the SITRANS LU150/LU180 by clicking here.